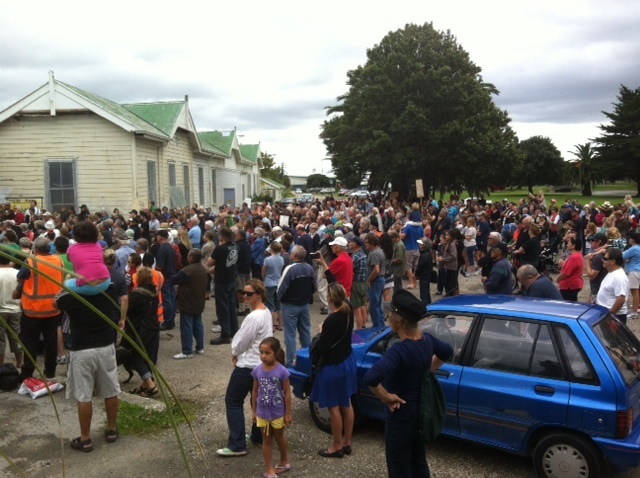 On April 14 approximately 2000 Gisborne people and others who travelled from the nearby Wairoa township mobilised to demand the reinstatement of the Gisborne-to-Napier rail line which is under threat. 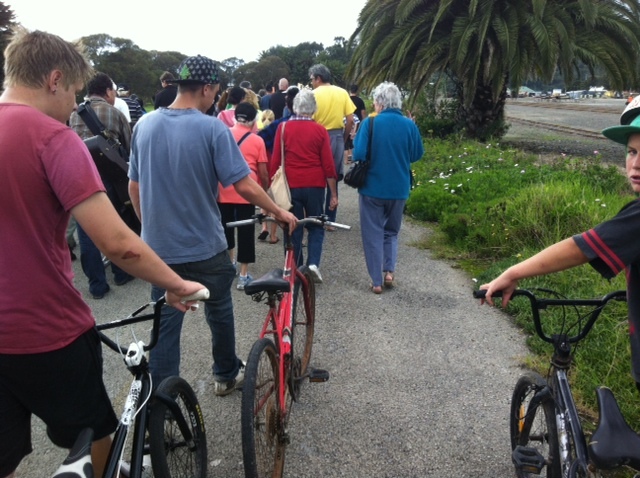 People on the demonstration were angry and frustrated because the New Zealand Railways Corporation (NZRC) which trades as KiwiRail had still not committed to rebuild the line after it was damaged by storms in the previous month, and this is still the case. It was due to a lack of maintenance that the track was badly damaged in several places. In one place between Gisborne and the Mahia Peninsula metres of track are suspended because of a preventable slip. It is broadly felt by those who demonstrated that central government doesn’t care about Gisborne because of its regional isolation. A refusal to fix the track will inevitably create fewer options for a city with income and employment statistics that have long been worse than national averages. According to the 2006 national census the average median income in Gisborne was $41,000 compared to the national average of $51,400. Forty nine per cent of people aged over 15 years had an income of $20,000 or less, compared with 43.2 per cent nationally. Only 11.8 per cent had an income higher than $50,00 compared with 18 per cent nationally. In a 2010 Household Labour Force Survey it was revealed that unemployment numbers had risen by 20 percentage points on the previous year and that Gisborne had one of the highest rates of unemployment in the country. More recent information shows again that Gisborne’s unemployment is high. Regional labour market reports for the December 2011 quarter showed that labour force participation (employment of those of working age) was 66.6 per cent, down slightly from the year before for the Gisborne/Hawkes Bay region. However the inclusion of Gisborne and Hawkes Bay in the same region skews the statistics as the Hawkes Bay’s cities of Napier and Hastings have lower unemployment than Gisborne. In relation to differences between Gisborne and Hawkes Bay a 2007 Department of Labour press release based on more in-depth research declared that ‘the two parts of the region face quite different futures’. The demonstration took place on Grey Street and started at ‘the old post office’ (a large post office building that was shut in the 1990s) before crossing the main road – Gladstone Road – and continuing down to the railway station. Before the march set off people signed postcards to send to local East Coast MP and National government cabinet member Anne Tolley. About 400 people started the march and by the time it got to the railway station the number had swollen to 2000 or more. The march was comprised of a variety of people, including young skateboarders at the very front, young people with bikes and BMX’s, elderly people and people who have disabilities. The campaign to restore the link is clearly cross-class in nature, meaning that it involves both employers and working people. While the demonstration was made up overwhelmingly of ordinary and working people who are greatly angered by there being no commitment to fix the track, there was also a strong pro-local business position presented by most of the event organisers and speakers. 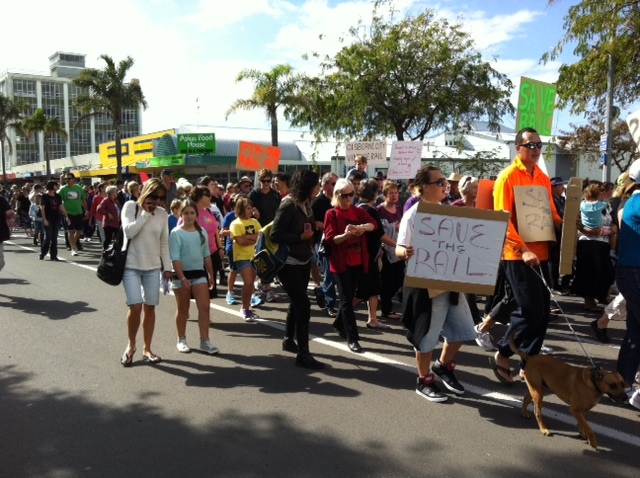 The demonstration was led by Gisborne’s four-term Mayor Meng Foon who led chants on a megaphone. Politically Foon could be described as centrist and populist. For example, in terms of populism, while it is uncommon for non-Maori local or central government politicians to learn te reo Maori (Maori language) it is well-known that Foon is a fluent speaker in a region which has the highest Maori population of all regions in New Zealand (41 percent of the Gisborne population is Maori compared with the national proportion of 14.87 per cent). During speeches Foon joked along the lines that Anne Tolley made her apologies for the day. Other politicians included Gareth Hughes – the Green Party’s energy spokesperson who originates from Gisborne and Moana Mackey, a Labour list MP and previous candidate for the East Coast electorate. Ruth Romero, a Gisborne resident who initiated the march also addressed the crowd. Two Gisborne employers spoke, one from a produce company which wants the line restored for exporting and the other from a transport company. They were viewed positively by the demonstration participants. However, while reinstating the line might benefit some employers the real reason for the failure of KiwiRail so far to make the four million dollar commitment actually lays in the agenda of powerful employer interests which have carried out an offensive against ordinary workers for the last thirty years. This was first initiated by the fourth Labour government which came to power in 1984 and was led by people like Richard Prebble and Roger Douglas who later left Labour and formed the Act Party. In the interests of the employing class that government and successive governments have privatised state-assets, deregulated industries, reduced the powers of inspectors, driven down wages, structuralised unemployment and carried out other measures to shore-up profits to the detriment of ordinary people. If an entity does not produce profit, or sometimes if it does not produce an immediately realisable profit, then the logic of this system is that the entity doesn’t matter – even if the entity would greatly benefit ordinary people. The last-Labour led government campaigned to ‘bring back the track’ and did so shortly before the Key government came to power. But the NZRC is run like a state-owned enterprise, meaning still its function is to make profit rather than serve communities. The alternative that socialists fight for is the unlocking of the massive amounts of value created by working people every day. Instead of that value becoming profit, socialists argue that this value should be used to take care of the needs of ordinary people and their communities. 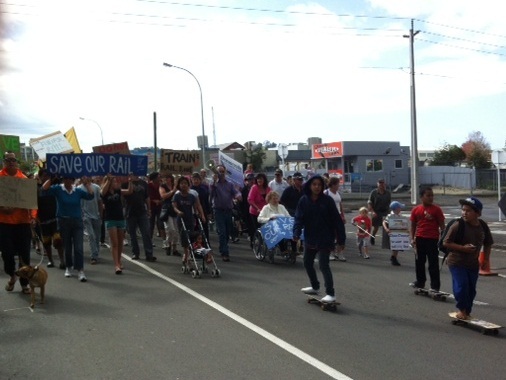 Demonstrations like the one in Gisborne are not only important for the local community, they are also important for raising questions about the whole profit system. People or profit?